Are you ready for a new experience in the Victoria, TEXAS area? We have the answer! Painting with a Twist is a great place to have fun with your friends, or meet new ones! We have something for everyone! Bring the family, have a date night, have a Girls Night Out, or simply treat yourself! Relax, be you and discover your inner artist. Bring your favorite bottle of wine or beverage (we don't judege), and paint along with our artist to create your own work of art that you will take home at the end of the evening. We take you step by step! No Art Experience Necessary! We provide all painting supplies and artist instructions. Just bring your own drinks and snacks, and be ready to have a Twisted good time! We do NOT serve ice, but you are welcome to bring some and use our ice buckets and chillers. Two hour classes are offered for $35 per person and three hour classes are $45 per person. Our 1.5 hour paintings, usually for ALL AGES, are $25 per person. Our Daily classes are fun for you and a friend or small group. ADD a class or switch out a painting Sunday - Thursday with payment for 5 reservations! Availability may vary. Private parties for adults or kids are great for groups of 15 minimum Sunday thru Thursday and 25 minimum on Friday and Saturday. You will also receive an extra complimentary hour to enjoy your celebrations. 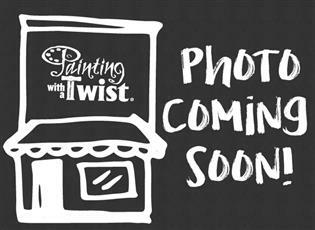 Party Planners of 25 and more will receive a $35 gift certificate to come back and paint again! We do offer ways to choose the painting with out making large Private Party minimums. If you reserve 5 seats Sunday thru Thursday we can change or add a painting as long there are no other reservations made. Friday and Saturday you would need to reserve at least 15. If paying cash, please bring exact change and come early so we can check you in and prepare your paint station. NOTE: Walk-ins are welcome as long as there are seats available. Paying online or over the phone guarentees your seat in case the class sells out.